ProppaNOW was set up in Brisbane in 2004. It is a small collective of urban Aboriginal artists. Their art is “about lives that we actually live, the people that we actually know and issues that concern us as modern peoples” (Ah Kee, 2012, 10:00). Their art is not dots and images of Dreamtime – in fact they see that style of painting as a white construct, controlled by and for the benefit of white people, giving a utopian image that allows daily realities to be ignored. Instead proppaNOW engages with the issues and politics and particularly racism that they face every day. Vernon Ah Kee (2009, 3:05) states “Art asks questions. That’s the whole point of it”, while Richard Bell (2010) declares “There is no better platform for politics than art … this way I don’t get arrested”. The name itself refers to an Indigenous colloquial expression, the ‘proper way’, meaning the correct, respectful way – the correct way for Aboriginal people today. To provide mentorship to less experienced members. In their drive for professionalism, seeing themselves at an elite level of artmaking, as well as providing support group members “fiercely” critique and question each other. “It’s not easy to be in this group. It’s hard. It’s meant to be. We’re meant to keep each other honest, we’re meant to maintain the quality of our ideas and the quality of our skills.” (Ah Kee, 2011, 10:36). The current Insurgence exhibition at the Museum of Australian Democracy (located in the Old Parliament House). (Some notes on my visit to the exhibition are below). I saw the Insurgence exhibition when I was in Canberra late last year. It is in the Museum of Australian Democracy at Old Parliament House. The photo above shows part of the building, with a fragment of Vernon Ah Kee’s textual work visible across the windows. The artists themselves note the irony in the location (Ah Kee, 2013). For many visitors the venue must give an additional emphasis and weight to the exhibition and to its importance at the heart of Australian democracy. Another site of great significance is just across the road. The Aboriginal Tent Embassy (http://www.aboriginaltentembassy.net/) celebrated its 40th anniversary in 2012. It was important to Vernon Ah Kee to have his work visible from the Embassy. Ah Kee’s textual works use a bold sans serif font with spacing used to emphasise thoughts rather than individual words. The actual words are difficult to decifer and the message contained even harder for one from a different background to read. The large work on the wall in the first room of the exhibition states the viewer’s “duty is to accept truth” and served as notice to the effort these artists demand of viewers. Indeed the Museum’s signage and website include the warning “some artworks contain explicit images, language and ideas that may offend some viewers”. Inside the exhibition Ah Kee’s text appears directly placed on the walls. While this tactic is used by many artists here it seemed to add extra layers of meaning – as he took possession of this place, the headquarters of the colonial powers who took his home; or perhaps as graffiti, that guerrilla form of protest and resistance. I was reminded of Ruth Hadlow’s work, mentioned in my post 20-Sept-2013. She also uses text on walls and examines the experience of being other and the loss of identity living in a different world. Of course a most significant difference is power – Hadlow chose to live in a different country and to negotiate her place as an artist in a different culture. The artists’ of proppaNOW have had their country stolen, their culture sidelined. However Hadlow’s comments about the arrogance of familiarity and about response ability seem relevant here where the artists are disrupting the familiar and challenging the arrogance of their audience. 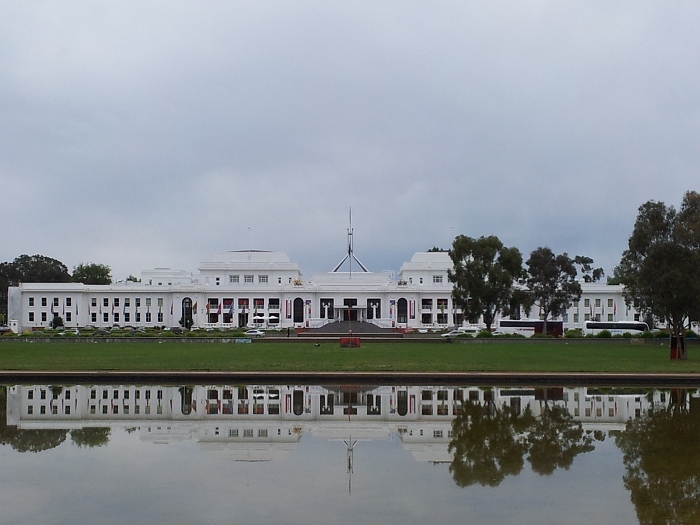 Returning to the significance of the location of the exhibition, in the photograph to the right Old Parliament House can be seen with the Aboriginal flag of the Aboriginal Tent Embassy in front and directly behind the huge flagmast of the new (1988) Parliament House. Gordon Hookey’s animation Terraist (2012), also shown in Insurgence, seems to occupy the same space. The animation can be seen at http://www.theloop.com.au/CarbonMedia/portfolio/gordon-hookey-terraist-2012/130888 and a video where Hookey speaks about the work at http://vimeo.com/68745526 – both are shown in the exhibition. There are layers and contrasts of meaning – the tents of invading colonisers spread across the land, but also the Tent Embassy. The animation is like a child’s flip-book, but the figures hold guns. Hookey sees colonialism as terrorism and has “coined a term ‘Terraism’ (taken from terra nullius) to push an Aboriginal agenda in the debate in regards to our continual fight for our lands” (Hookey, 2006) as used in the animation. The two words play against each other, witty but with the ugly underlying terr-or of the colonists against the spiritual connection to the terr-a of the Aboriginal people. Hookey has taken the kangaroo, an iconic symbol of Australia seen on the national coat of arms and in the logo of Qantas, the flag carrier airline of Australia, and made it “a figure of resistance and strength and also a metaphor and symbol of Aboriginal people” (Hookey, [n.d.], 1:31). What has been taken from him he reclaims as his own. 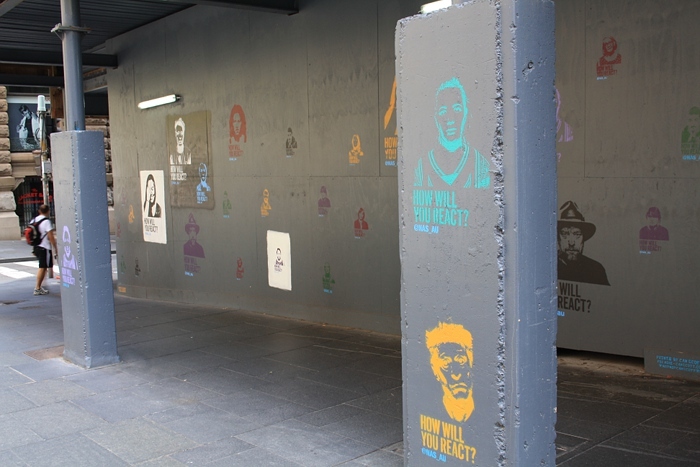 Walls of Resistance (2013) by Jennifer Herd is the continuation of a project that began in 2005. A distant view of the installation can be seen at http://proppanow.wordpress.com/2013/11/18/insurgence-at-museum-of-australian-democracy-at-old-parliament-house/ and a detail of the related 2005 work Cruciform from Walls of Resistance is on page 34 of Edmundsun and Neale (2007). The detail of this work is exquisite, delicate, fragile. Small box frames contain lozenge shapes, made of cane and cotton and pearl buttons. Lines of small holes pierce the backing, adding texture and pattern. There is a jolt of recognition and understanding when one finds the lozenges are warriors’ shields, the holes the punctures of bullets, the pearls “reference so many tears shed during the wars of resistance” (Herd, 2013). The work is a memorial, beautiful and fierce, vibrating with pain and loss and pride. The beauty engages her audience, then the emotion and understanding hits. Herd began the project “in response to a proposed memorial to Aboriginal soldiers who had fought and died in the World Wars” (Herd, 2013). She wanted to honour those others who fought and died for their country – against the invading Europeans. An interesting parallel is the Aboriginal Memorial (1988) at the National Gallery of Australia (see http://nga.gov.au/AboriginalMemorial/home.cfm), an installation of hollow log coffins which commemorates all the indigenous people who have fought and died for their country – but this is in the desert style of white constructed and controlled ‘Aboriginal art’. There is also a parallel in the research I did on The defence of Rorke’s Drift 1879 (see post 24-Oct-2013), where I found a memorial to the Zulu warriors victorious at Isandlwana wasn’t erected until 1999. 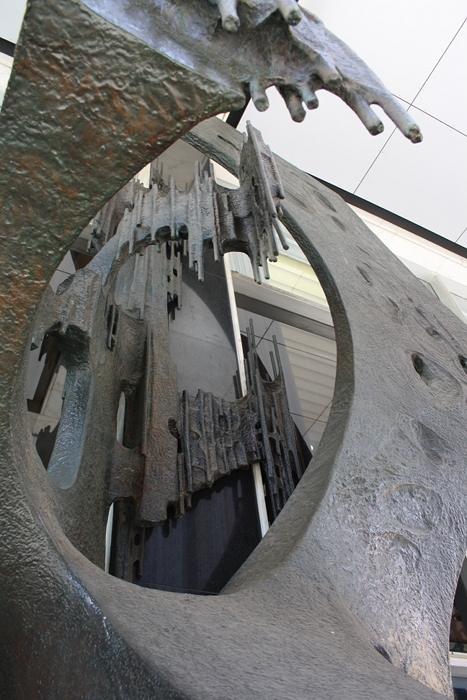 In that instance the belated memorial to those who died for their land was created by a non-Zulu artist and the artist’s “attempt to fuse a Western, Eurocentric concept with local imagery and Afrocentric references” (Marschall, 2008) becomes even more uncomfortable upon review. The recent selection of Tony Albert to create an artwork to honour Aboriginal and Torres Strait Islander service men and women (see links above) highlights the complexity of modern Aboriginal existence. For Albert, his family history makes creation of the memorial personal and meaningful. For Herd such a work was the impetus for a whole body of work. Layers of pain and mistreatment. The final work I want to mention is not in the Insurgence exhibition. Richard Bell’s Big brush stroke (2005) is in the collection of the National Gallery of Australia (see http://artsearch.nga.gov.au/Detail.cfm?IRN=163586). This is a witty appropriation of the work of Roy Lichtenstein, using the colours of the Aboriginal flag, and the ben-day dots a nod to ‘acceptable’ Aboriginal art. It takes on the games of the Western art world and wins. There is a raw edge in Bell’s license to mimic the ben-day dots contrasted to his exclusion from the style of other Aboriginal artists. I wonder about the work’s display in NGA’s Aboriginal & Torres Strait Islander Art Urban gallery. On the website the Gallery’s collections are divided: Indigenous; Australia; Asia; Europe+America; Pacific… Does that tell us something? I went to look in the “Australia” collection and the first image I saw was Portrait of Nannultera, a young Poonindie cricketer [Native of South Australia, pupil of the Missionary Institution of Poonindie] (1854) by J.M. Crossland (http://artsearch.nga.gov.au/Detail.cfm?IRN=62236). It made my skin crawl. ProppaNOW could be regarded as an example of the post-modern multiculturalism described by Honour and Fleming, artists who “not only resisted acculturation but found new ways of expressing themselves without severing links with their own traditions or ignoring global developments in Modernism and Post-Modernism” (Honour and Fleming, 2009, p. 888). Edmundson and Neale (2007, p. 29) suggest that experiencing “discriminatory abandonment” the individual artists in proppaNOW “had reached the limit of their tolerance and the collective became a strategy for cultural survival and a site for activating Indigenous agency”. While I find their material challenging, showing a side of Australia I would like to but cannot deny, the various artworks show a vigour and an integrity and a relevance in both art-making and content that is engaging and thought-provoking. Bell, R. (2010) Quoted in publicity material for Insurgence exhibition, Museum of Australian Democracy, 22-Oct-2013 to 11-Mar-2014. I’m not confident that I understand the requirements for this exercise. We are asked to return to the idea of art as a symbol, choose a symbol “for this year” and consider what is being symbolised, the symbol chosen and who I’d choose to design/make it. The course notes illustrate this with an image of The Long Man of Wilmington by Eric Ravilious, so I’ve decided the requirement is steps towards an artwork incorporating the symbol rather than a graphic like a company logo. My symbol for the age is the smartphone and the access to communication and information which it offers. It has transformed the way people interact, keeping in touch with frequent and brief calls and texts, simplifying arrangements to meet. It makes it easier to find others with similar interests and views, and to participate in wide-ranging group discussions. It allows for greater mobility for both business and personal users, providing a continuity of connection. The many apps available simplify and support busy lives, a trivial example being one that records one’s yarn stash and keeps impulse buying focused and effective. It allows fast and easy access to all the resources on the internet. It supports better health with exercise-tracking apps and access to information on pharmaceuticals. It impacts the way we access news, and the news available (not just that filtered by major newspapers). I use mine to take photos of great textiles I see being worn on the streets, to record oral history of WWII with my mum, to set alarms, listen to educational talks (eg http://www.cofa.unsw.edu.au/events/cofa-talks/listen), check how long to the next bus, send a grocery shopping list to my husband, and sometime even to talk to people. All that and my younger work colleagues tell me I’m only scratching the surface. It’s been used in art works – in the 2013 Bondi Sculpture by the Sea Simon McGrath provided an “augmented reality app” which allows users to “view” a melting iceberg in the ocean (see http://simonmcgrath.com.au/sculpture-by-the-sea-bondi-2013/). There is so much more, but the two fundamentals are communication, in particular social networking, and information. There are certainly negatives, but there are overwhelming positives and the positive is the focus for this exercise. This is where I’m a bit shaky on the requirement. There’s the slim rectangular shape with colours and buttons that we use but that doesn’t seem very interesting. In any case the focus is the facilities the smartphone provides, in particular communication, networking and information. So my symbol should be realised as an installation that allows people to use their smartphones to interact with the artwork and each other, with results that surprise, delight, inform and challenge them – that presents the world in a way that they hadn’t thought about before. It should be multi-faceted and distributed because that’s the smartphone experience. Perhaps people could send photos and soundclips to a central system where they are organised and combined according to a sequence designed by the artist. While thinking about possibilities I imagined the final sequence displayed in lights on a building, like Vivid Sydney – http://www.vividsydney.com/ – a site which seems to offer more possibilities than I can take in at the moment. It’s much more than I realised. I don’t know what’s possible or what’s already been done. Perhaps my smartphone symbol could involve people providing their input, then while watching the output on a huge building the crowd could hear and share music on their phones. Many, many years ago I went to a prom (music concert, not a coming out dance) and one piece used the audience as a huge choir. The conductor taught us sounds – one section of the audience hissing, say, another a short sequence of wowing or whatever – then conducted us through the piece and it was exhilarating. Could the technology send different sounds to different phones so the audience becomes a huge orchestra? I can imagine a kind of feedback loop over a festival period, so people take photos one night which feed into the next night’s performance. Or perhaps smaller groups could collaborate over their phones to create something that goes into the mix. I can also see these ideas being integrated in a gallery setting, or at specific locations or at indeterminate locations depending on those interacting. I think it would be important to have a conceptual edge, a theoretical underpinning to make the total thing a work of art and not just a lot of stuff. I need an artist with the skills and the artistic vision to take all these elements and create a work which both uses smartphones as a material and symbolises all that smartphones mean in our society. As already mentioned it needs a solid foundation of theory and concept to make the whole more than the parts. I don’t have any specific artists to suggest since I’m imagining beyond my knowledge or experience. A good place to start in identifying an artist or group of artists would seem those who have participated in past Vivid programs, or similar events in other locations. I seem to have strayed well beyond course concept in writing this – but really it is a logical progression from my choice of symbol. If it’s a symbol for this age it ought to create art which uses the technologies of the age, which stretches boundaries. 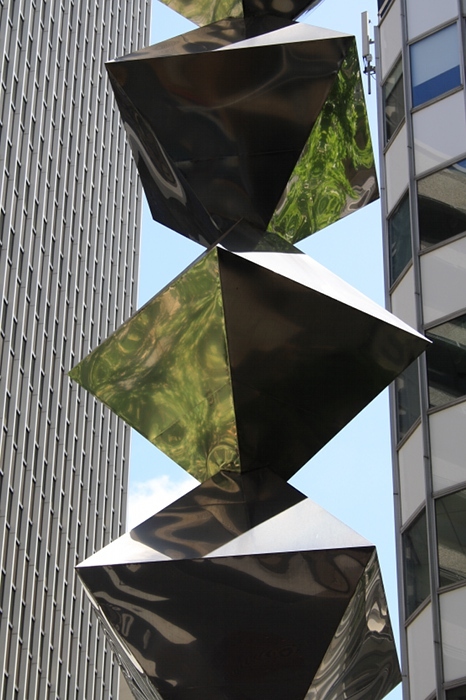 This exercise requires a visit to a public square and review of the sculpture there. 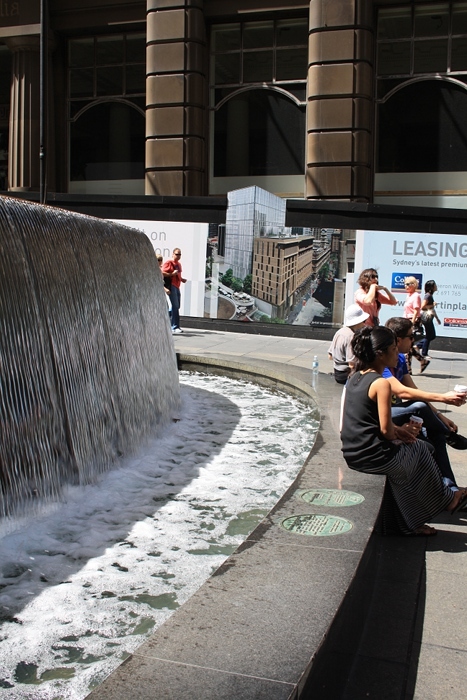 I chose Martin Place which cuts across the centre of Sydney, from George Street and the GPO in the west up to Macquarie Street – a total of over 450 m, although broken up into five sections by cross streets. I originally intended to focus on the first section outside the GPO (General Post Office – now a hotel, restaurants, shops etc), but widened my search when I discovered that this major city space has very little sculpture. I used to think of this extended space as the centre of Sydney – literally as distances are measured from the GPO at one end, but also used as a gathering place and connecting business, shopping and government areas. The city is more complicated now, and when I visited this week it seemed rather lost and forlorn – many offices are closed or scaled down for the holiday season, the big end of year sales are a block or two to the south, and most temporary structures have been removed ready for the New Years Eve crush. 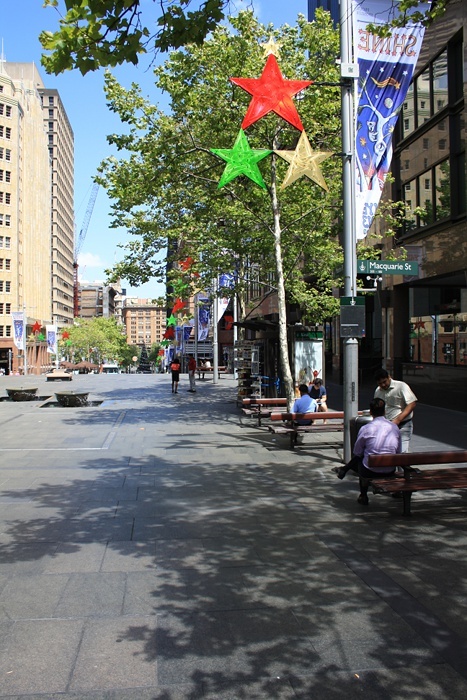 As you may be able to see in the overview photos there is a lot of street furniture in Martin Place – seating, kiosks with flowers, newspapers or drinks, various banners and signs, trees, also an amphitheatre area. However I was surprised at how little sculpture I could find. The Cenotaph, built as a memorial to soliders in the First World War and now a memorial to so many more, stands prominently in the space outside the GPO, arguably at the heart of Sydney. The bravery, mateship, determination, skill and intelligence of the Australian troops in action in WWI, and particularly at Gallipoli (ultimately a costly failure), has come to have iconic significance in Australian cultural identity – the “ANZAC legend” (Australian and New Zealand Army Corps). A Dawn Service is held each year in Martin Place on April 25th (ANZAC day), the anniversary of the landing of the first wave of Australians at Gallipoli in 1915. The Cenotaph’s base is Moruya granite. 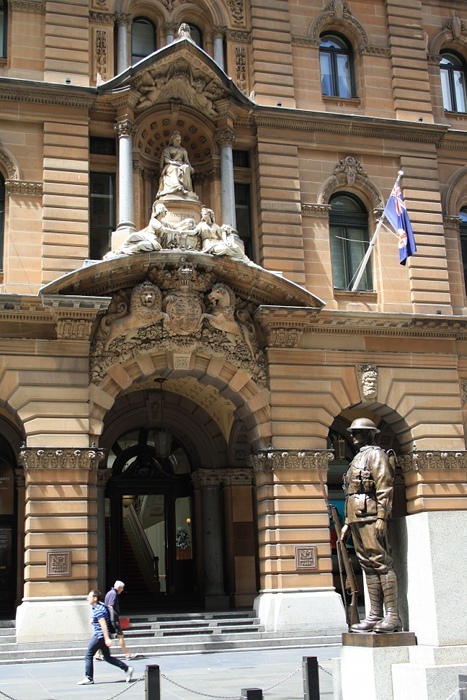 The two bronze sentinel figures, a soldier and a sailor, are by Sir Bertram MacKennal. This sculpture is a clear statement of national identity and civic pride. War by its nature is an expression of power, but this memorial’s focus remains personal. The figures are based on individuals, the Dawn Service is not about dignitaries, and I have seen many personal bunches of flowers among the wreaths. Behind the Cenotaph can be seen part of the GPO, including some of the extensive carving and many statues. Constructed between 1864 and 1891 the building was intended to symbolise Sydney, rather like the Houses of Parliament in London. The marble sculptures, designed by Tomaso Sani and carved in Italy by Giovanni Fontana, caused an outcry when unveiled, with both naturalistic style and representations of real people seen as unsuitable. Questions were asked in Parliament and removal of the figures considered. The uproar over the sculptures seen as crass and low-brow shows the aspirations of the establishment of the time. The intended political and economic message may have been temporarily lost, but after only a short time few passing this large and imposing building would be aware of the lack. 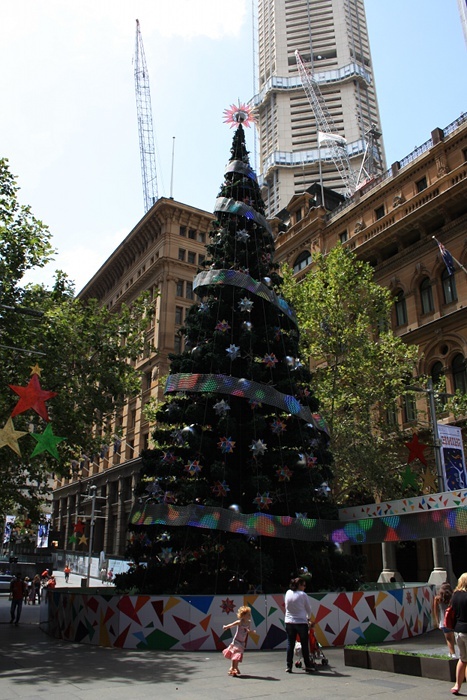 At the other end of this first section of Martin Place there is currently a Christmas tree, which could be seen as a sculpture and an indication of influence of a sub-section of the community. This area is often used for temporary displays and sculptures – not so long ago gigantic snails in neon coloured recycled plastic. My impression is that the works are often ones that appeal to the young or young at heart – a little lightness and fun in the centre of the city. Crossing Pitt Street to the next section of Martin Place one comes to a curved wall of water, the Lloyd Rees fountain (1972, rebuilt and moved slightly in the mid 1990s). Lloyd Rees (1895-1988) was a prominent landscape painter and is quoted on the fountain’s plaque “what else is a city – if it’s not a gallery of beautiful buildings”. The fountain also had a difficult initial history. Planned as part of a series of works pedestrianizing the block the City Council dropped the proposed fountain due to budgetary concerns. Rees responding by leading a public subscription to raise the necessary funds. The fountain now serves a number of needs. Structurally the wall of the fountain serves as the back of the amphitheatre behind, taking advantage of the slope of the land. It brings sparkling light and the sound of running water to the area, and it is clearly a popular spot to sit. I didn’t actually know the name of the fountain until preparing for this Exercise, and I suspect the fountain is not particularly effective as a memorial to Rees. There is not much else of note in this section of Martin Place. There are a couple of building sites – one with the hoarding used by a local art school to advertise their end of year show. This photograph is taken from the third section, looking back (you can see the clock tower of the GPO at the very right of the photo). In the foreground is another aspect of the site’s functional purpose – one of the entrances to Martin Place railway station. Also of note is the break formed by the MLC centre and the mushroom of the Commercial Travellers’ Association premises in the wall of buildings stretching along Martin Place. At this point of my exploration I found the mix of textures and shapes in the cityscape of more interest than any sculpture visible. The narrow fourth section of the Place is even more featureless. 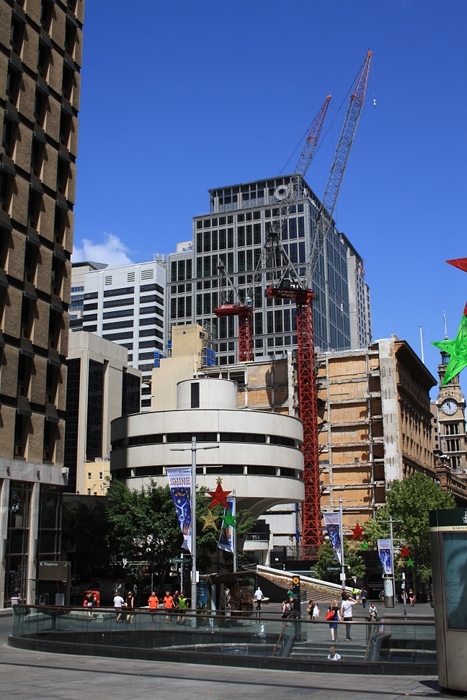 The final section of Martin Place has a number of items of interest. 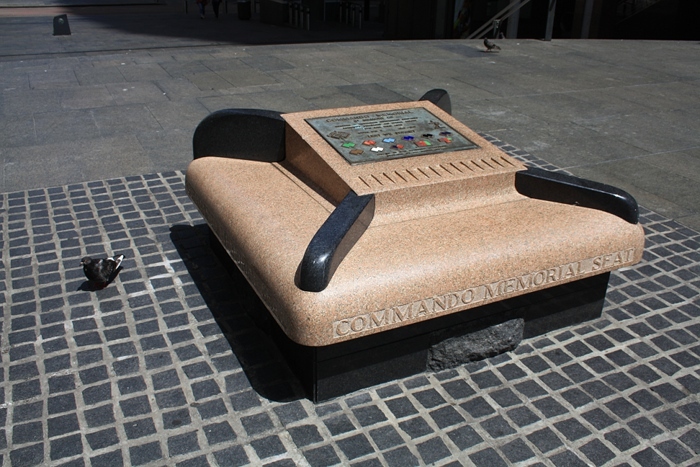 The thumbnail shows the Commando Memorial dedicated in 1982 in memory of members of Australian independent companies commando squadrons and special forces in WWII. I like the brisk and practical presentation of the memorial as seating, as well as the splash of colour and texture in the area. 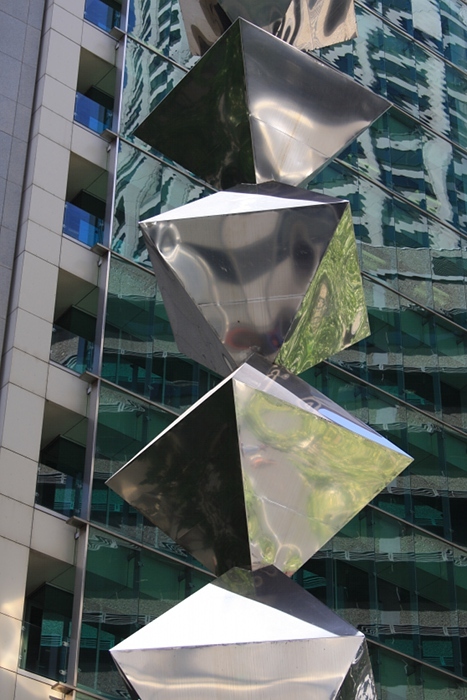 Passage by Anne Graham was created in 2001 as part of the Sydney Sculpture Walk. 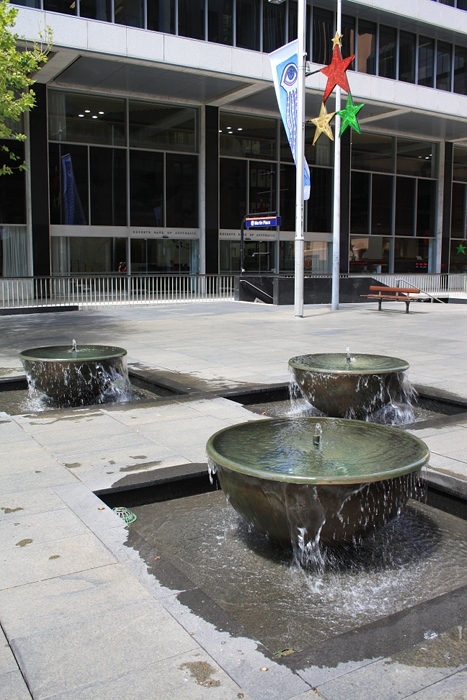 With its deep bronze bowls the sculpture references to the location’s past, including the domestic use of water (the lower part of Martin Place was built over the Tank Stream, a significant water source in the early colony). There is also a mist function which creates ghostly outlines of demolished houses, but I can’t recall ever seeing that in action. This work in a gentle and understated way celebrates the social and domestic history of inner Sydney. The separate elements are sensitive to the needs of pedestrians, while allowing the sculpture as a whole a larger footprint and presence. I’ve read that the mist of water can cause difficulties to passersby and this may be behind its relatively infrequent use. On a sunny day it seemed a missed opportunity. 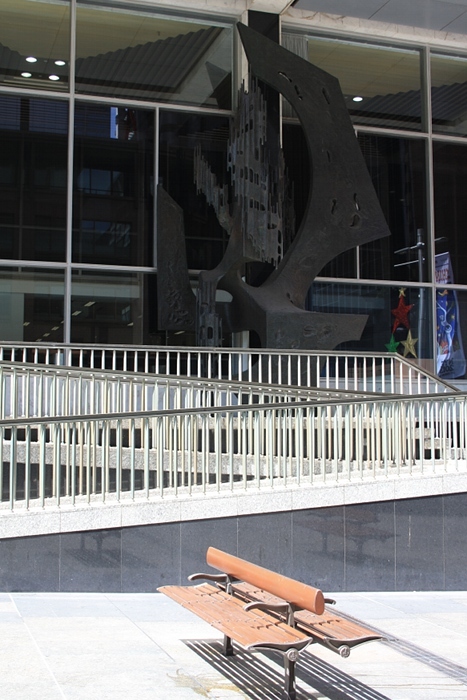 The final sculpture I identified here is actually on the forecourt of the Reserve Bank of Australia (RBA) Building – Free standing sculpture by Margel Hinder (1964). Its abstract but rather gothic form contrasts and responds to the clean International Style architecture of the building. Although named “Free standing” the sculpture closely wraps the external pilaster, almost like ivy up a wall. The sculpture reaches virtually the full height of the portico and for what is actually quite a large item (2 tons of copper with a solid steel core) it seems almost self-effacing. I think this is due to the relative shadow under the building and the height difference from the level of a pedestrian in Martin Place up to the sculpture itself. In an RBA publication there is a rather nice reproduction of a cartoon by Paul Rigby, where Hindel’s sculpture has become an overbearing bank manager leaning intimidatingly over the desk towards the overdrawn (ho ho) Rigby – see http://www.rba.gov.au/Museum/exhibitions/planned-for-progress/pdf/planned-for-progress.pdf, page 17. 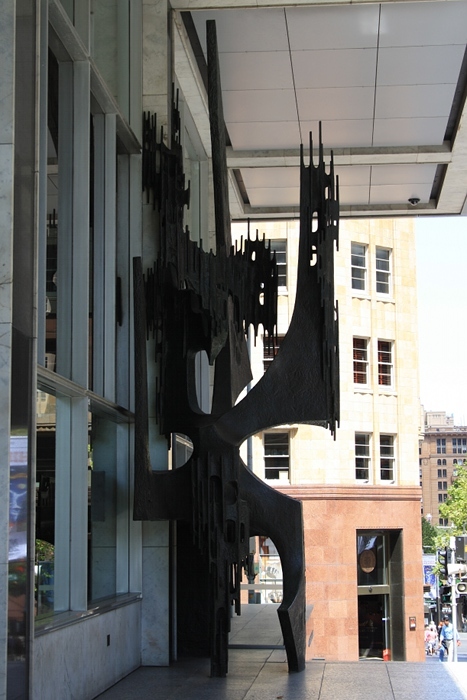 The sculpture is an effective expression of the importance and economic might of the RBA, and of its confident, modern and progressive stance at the time built. 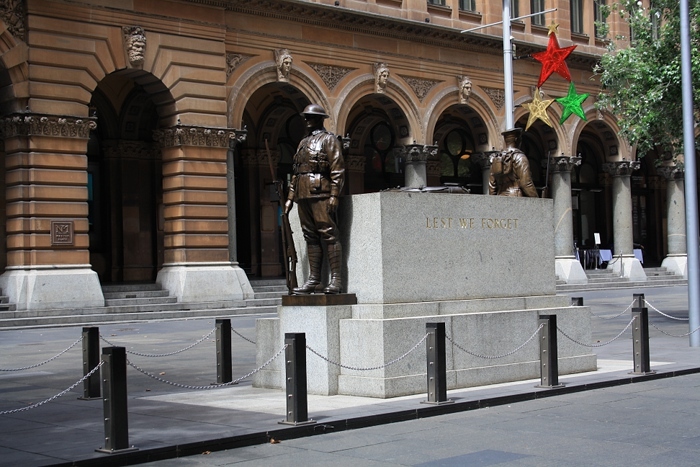 I think this upper section of Martin Place is the most successful in the combination and placement of sculpture – the Commando memorial, Passage and Free standing sculpture. Each work has its own place and identity. The space overall has plenty of interest and variety, while the needs of people moving through are treated considerately. Even the shadows contributed to the overall effect, providing extra layers of visual texture. 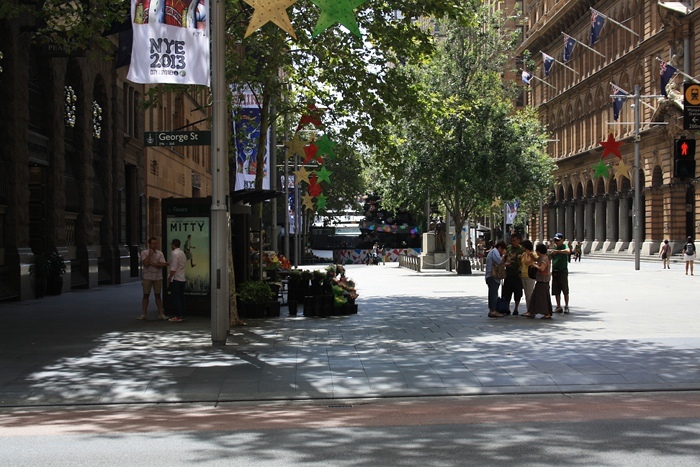 The lower part of Martin Place also meets ceremonial, practical and to an extent aesthetic needs. However the middle three sections from above the Lloyd Rees fountain are a wasteland with utility apparently the major goal. It’s true that often the amphitheatre is in use and the area just above filled with temporary stands and activities, however this is the area I would focus on if commissioning a new sculpture. 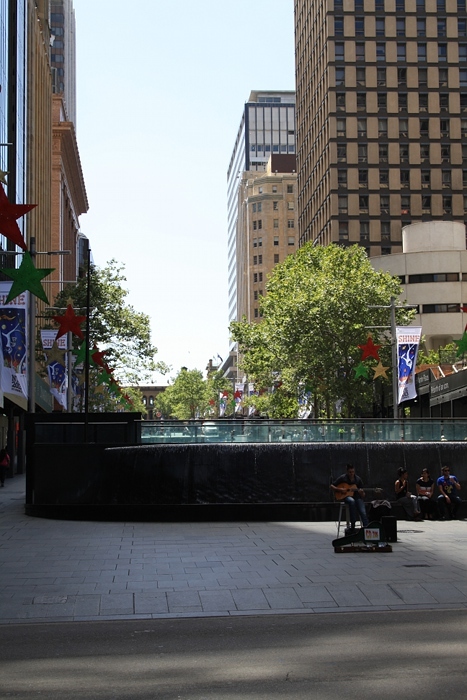 Most of the current furnishings of Martin Place are low, with only banners and trees breaking above human height. Certainly nothing challenges or even directly relates to the tall buildings around. I would like to introduce something with height, which would also allow the footprint of the work to be relatively small, useful in a busy area with high pedestrian traffic. Many of the surrounding buildings are fairly old and built in sandstone, so a contrast in materials could be effective. 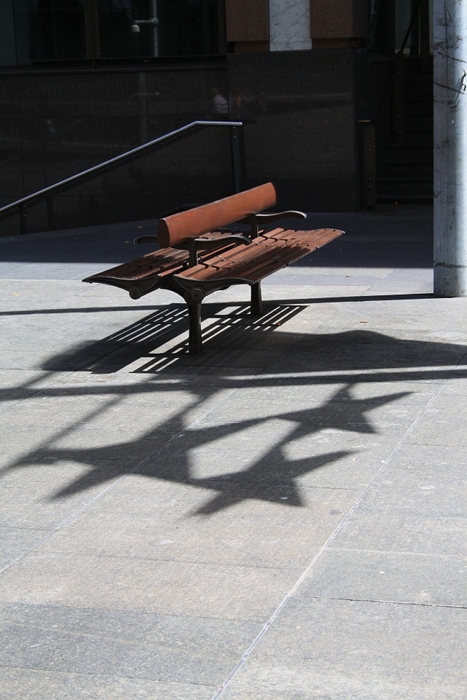 Martin Place can also be quite dark and overshadowed by the buildings around, so a sculpture that reflects light around could brighten the area. While this overall brief is quite general and could be interpreted by an artist in many ways, there is a work already available which would meet requirements. In fact it was designed for this exact location. Pyramid Tower (1979) by Bert Flugelman won a 1978 design competition organised by the Sir William Dobell Art Foundation and the city council. I’m not sure of the precise location where it was installed in 1979 as things have been moved about a little, but close to the Lloyd Rees fountain. Even before installation it was controversial, seen as too large for the space (see Glascott, 1979). It was quickly nicknamed “the shish kebab”. One woman I knew, the art teacher mother of a friend, believed it was too derivative (I think she may have been referring to the work of David Smith – eg http://www.columbusunderground.com/sculpture-thenish-and-nowish-david-smith-and-alina-szapocznikow-at-the-wexner-center). The sculpture was removed in 1996 – the area was being remodelled and the mayor of the time seemed particularly negative to the work. 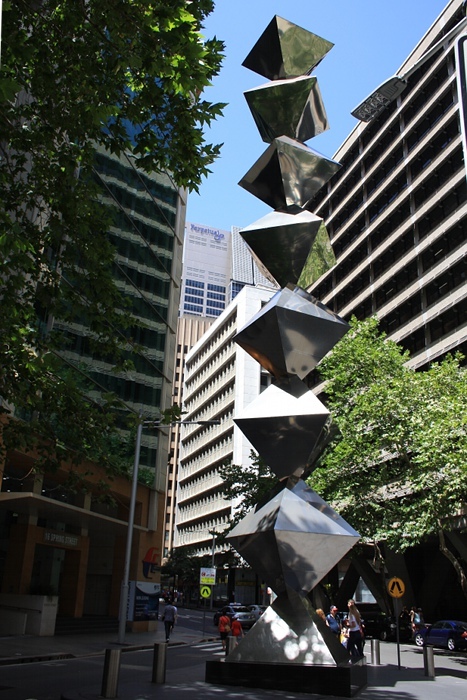 After a few years of uncertainty the sculpture was re-established a few blocks further down Pitt Street. Pyramid Tower now sits on a small traffic island surrounded by buildings and rarely catching the sun. I think it sits well in the area, sharing reflections with the buildings around and giving a different perspective to passersby. It seems strange that a work that was considered to need more space than Martin Place should now be in such cramped quarters, but it seems flexible enough to give pleasure and interest in its new surroundings. There have been suggestions of reinstatement (see links below), but I can’t see it getting any traction. That still leaves a large section of Martin Place in the wilderness in sculptural terms. The City of Sydney Council has an active arts and cultural program, but it seems to have bypassed the heart of Sydney. Pyramid Tower – Glascott, J. (1979) “Controversy over site for sculpture” in The Sydney Morning Herald 11-April-1979 [online] Available from http://news.google.com/newspapers?nid=1301&dat=19790411&id=nv5jAAAAIBAJ&sjid=oeYDAAAAIBAJ&pg=5080,3540518 (Accessed 30-Dec-2013). This exercise asks for thoughts on some questions on abstract expressionism. To what extent does a concern with elemental humanity represent a reaction to the cataclysmic events of 1939-45 and the displacement of so many Europeans, including a number of artists, in the wake of the Second World War? The impact of war on twentieth century art was seen well before the Abstract Expressionists. Picasso’s Guernica of 1937 (see www.museoreinasofia.es/en/collection/artwork/guernica) may be the best known example. Before that, the searing brutality of works by Otto Dix (for example www.artgallery.nsw.gov.au/collection/works/259.2004/), George Grosz and Max Beckmann and the grief of Käthe Kollwitz (www.awm.gov.au/view/collection/item/ART50253/) responded to WWI. Denvir (1975, p. 55) described Grosz as “using visual violence to excoriate the establishment and propagate his own democratic ideas”. American artists in this period were turning against the previously accepted traditions of Old World painting and I think it is possible that this was influenced by a perception of failure of the traditional systems in politics as well as art. They may also have felt able to venture away from recent European-based movements such as Surrealism because of the sense that the cutting edge of culture and artistic development was now in America, and particularly New York. There was a feeling of “immanent self-importance” and “a common goal was perceived to be the mystery, violence and spontaneity associated with the modern experience on all its levels” (Anfam, 1990, p. 79). Another indirect impact of WWII was felt when Cold War supporters in America promoted Abstract Expressionism, the movement becoming “enshrined as America’s aesthetic ambassador to the world and a symbol of its superior freedoms” (Anfam, 1990, p. 174). Rothko said that, ‘The people who weep before my pictures are having the same religious experience I had when I painted them. And if you, as you say, are moved only by their color relationships, then you miss the point’. Does it matter if viewers of art works ‘miss the point’ provided that they take something from it? This question connects back to earlier discussion on myths as a subject in art – see 2-Nov-2013 – and Rothko himself used symbolism from myth, “totem forms and hieroglyphic annotations [to] evoke such grand themes as conflict, sexuality and death” (McAuliffe, 2013, p. 28). In my November post I suggested that meaning could be shared without knowing the specifics of a myth, that some gestures are universal and speak to shared humanity. To me that argument doesn’t seem to hold when considering abstract expressionism, but this is at odds with a conviction spreading in the late 1930s “that meaning could be conveyed through the physical primacy of the medium” (Anfam, 1990, p. 55). Rothko also said “It is our function as artists to make the spectator see the world our way – not his way”, but I don’t think I can bridge the distance of time and culture. I spent time with two works by Rothko in Canberra – Multiform 1948 (nga.gov.au/international/catalogue/Detail.cfm?IRN=110509 ) and 1957 # 20 (artsearch.nga.gov.au/Detail.cfm?IRN=110506). I have no notion whether my emotions and thoughts overlapped in even the smallest way with Rothko’s as he painted. Perhaps there was some direct connection – who could ever say? I don’t believe it invalidates my experience one way or another. I spent time looking at the painted surface as a painted surface, and in a less focused reverie. On my walk to the gallery the next morning I saw this tree a bit differently. It seems trivial, but to me it is real and meaningful. Sometimes it seems arrogant to me, the expectation placed on viewer by the artists combined with minimal support. On the other hand, perhaps it was a combination of a belief in the power of their medium and a meaning that they couldn’t express in words. Speaking about She Wolf (1943) Pollock remarked it “came into existence because I had to paint it. Any attempt on my part to say something about it, to attempt explanation of the inexplicable, could only destroy it” (Pollock, 1944). Speaking about the same painting, an audio commentary on the MoMA website comments on the “rather frantic notations as if there were some message being transcribed … this urgency of human communications and yet you don’t know exactly what that communication is” (MoMA, [n.d.]). Thaw (1986, p.43) wrote “While the Abstract Expressionists as a group have overwhelmingly proved that abstract art can serve as a vehicle for the revelation of the unconscious, and therefore be a means to communicate artistic content of urgency to humanity, such meaning cannot be forced and must remain unspecific, untranslatable into words”. Perhaps I am showing my inexperience in Art and Art History by expecting to verbalise the communication of a painting. Is it possible to make any sort of formal analysis of these artists’ works – or of Pop Art? The ambiguity inherent in abstract expressionism creates a difficulty in analysis. De Kooning said “That’s what fascinates me – to make something that you will never be sure of, and no one else will either” (de Kooning, 1972). Basic visual elements remain, or their absence can be noted: lines and their nature, use of colour and tone, texture, depth of space, ground, shapes. There may be patterning, rhythms, differing density, stresses, different marks. Modern art may try to stress its autonomy, but there is always context – other work by the same artist, works by other artists, social and political conditions. Art may be responding to or commenting on consumerism, or exploring the artist’s own psyche, or experimenting with optical effects or the way materials interact. Much of this is open to description, comparison and evaluation – analysis. However “meaning” is more difficult. What do you make of Clement Greenberg’s assertion that ‘Realist, illusionist art had dissembled the medium, using art to conceal art. Modernism used art to call attention to art.’? I mentioned Greenberg when writing about Blue Poles (26-Dec-2013). 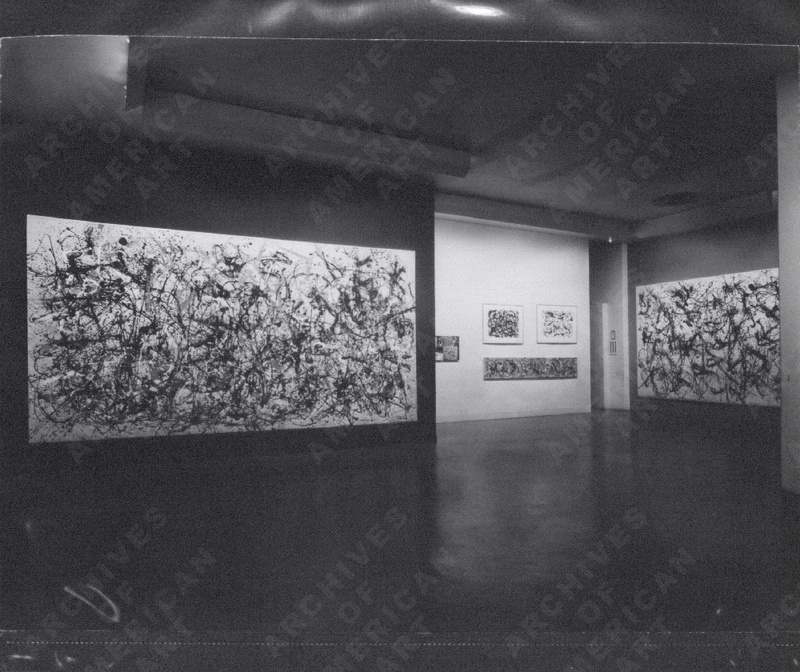 Greenberg championed Pollock when the work met his (Greenberg’s) theories about focus on surface and materials, then withdrew support (“shaky”) when Pollock stepped outside the theoretical boundaries. Honour and Fleming (2009, p. 844) conclude their discussion of Modernism and Formalism “[Greenberg’s] extreme version of Modernism can now be seen as belonging essentially to the Cold War years and in some respects limited by its reflection of that ideological and political climate”. Greenberg’s assertion quoted in the question is arguable true – “art” itself was the subject of some of the Abstract Expressionist art – but it isn’t complete. That was the concern of some artists of that time and quite possibly today, however other artists then and now have other concerns, and of course the same artist may have different concerns at different times. If art is an autonomous field of practice then any theoretical limits have to be provisional. That last bit came mostly from Glenn Adamson’s thinking through craft which I wrote about in a post 6-July-2012, so I won’t repeat here, however I will repeat a quote from John McDonald (2012) – when considering contemporary art “one can be a fashion victim rather than an art historian and no one will notice the difference”. Adamson, G. (2007) thinking through craft, Oxford: Berg. de Kooning, W. (1972), quoted in Anfam, D. (1990) Abstract Expressionism. London: Thames & Hudson, p. 179. Denvir, B. (1975) Fauvism and Expressionism. London: Thames and Hudson. McAuliffe, C. (2013) “America: Fascinating background to the works on show” in Look 12(13)/ 01(14) pp. 26-29. Sydney: Art Gallery Society of New South Wales. MoMa (The Museum of Modern Art) ([n.d.]) Jackson Pollock The She Wolf 1943 multimedia. [online] Available from www.moma.org/collection/object.php?object_id=78719 (Accessed 21-Dec-2013). Newman, B. ([n.d.]), quoted in Anfam, D. (1990) Abstract Expressionism. London: Thames & Hudson, p.77. Pollock, J. (1944), quoted in Anfam, D. (1990) Abstract Expressionism. London: Thames & Hudson, p. 87. Rothko, M. ([n.d.] a), quoted in Anfam, D. (1990) Abstract Expressionism. London: Thames & Hudson, p. 184. Rothko, M. ([n.d.] b), quoted in McAuliffe, C. (2013) “America: Fascinating background to the works on show” in Look 12(13)/ 01(14) pp. 26-29. Sydney: Art Gallery Society of New South Wales. Rothko, M. and Gottlieb, A. (1943), quoted in Anfam, D. (1990) Abstract Expressionism. London: Thames & Hudson, p. 78.
http://www.moma.org/interactives/exhibitions/2010/abexny/ Website of the MoMA Abstract Expressionist New York exhibition October 2010 to April 2011. During this course I’ve felt a bit defensive at times, working hard to throw off the shackles of colonialism slash imperialism, the tyranny of distance, the cultural cringe. 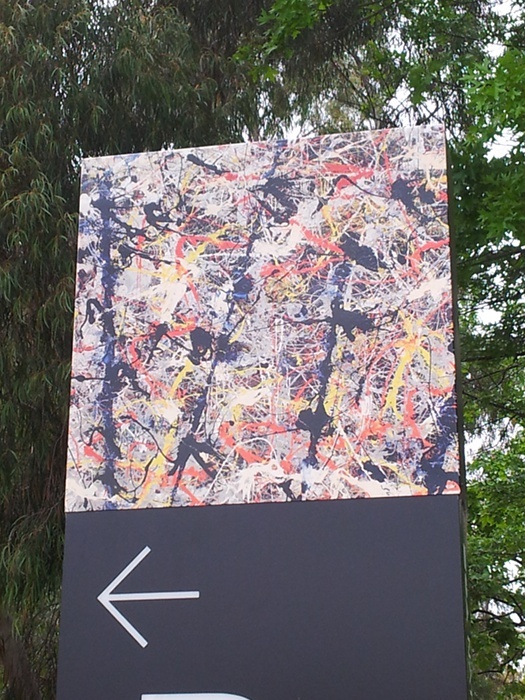 This is my moment – the photograph in the course notes illustrating this exercise shows Blue Poles by Jackson Pollock and it’s here in Australia. One could argue that we just swapped one colonial master for another and that Australian culture is still cringing, which has elements of truth – but not the whole truth and not relevant to the fact that a few weeks ago I was able to catch a bus to Canberra, just 3.5 hours down the road, and sit in front of Blue Poles at the National Gallery of Australia. I can’t include a proper photo (the one on the right is of a signpost to parking at the gallery). There is a wonderful video on the gallery website, artsearch.nga.gov.au/Detail.cfm?IRN=36334, with full views that give an idea of scale and also lots of great closeups. The video is definitely worth the time – I recommend choosing “full screen”, then clicking the button top right to turn off scaling. In fact if you have limited time I say forget any flat photographs of the full work or anything I have to say below – just watch the video. The presentation by Christine Nixon, Senior Curator, International Painting and Sculpture, is interesting but sound doesn’t matter. The painting is the star. The scale and sheer physicality of the work impress. It has raw energy, shows physical effort. It is heroic in scale and heroic in execution – one imagines the sweat of effort in creation, the painter moving up, down, around, over the canvas on the floor or wall, his whole body involved in arcing gestures as he poured and dripped the paint. It is a captured action describing the process of painting. There are many blues, also silver, white, yellow, red-orange… The blue or black is not just in poles, but laces across the canvas. There is a beige that seems to have been added quite late, but the complexity defies identification of a strict order of work although there must have been breaks to allow layers to dry. It seems that as well as the original gestural marks Pollock went back into the work, sometimes reconnecting areas that had been divided by a later colour. The eye moves constantly across and around, smoothly flowing, not jerky. At times I was aware of the flat surface, then suddenly would be lost in the depth of the paint – the colour and layers, but also the literal paint, crusting or squidging up in shoeprints, thrusting up from the surface, creating lines of shadow that emphasise flow and movement. The large scale of the work makes it easy to lose oneself inside the painting. The bench provided at the gallery is at a distance which makes one turn the head to see the sides; you can see some detail, but hop up to peer more closely at the intricate tangle of lines. Despite its size Blue Poles still seems human in scale, encompassed by the gestures of a man moving around it. There are eight poles. They could be a tribal dance, dark silhouettes in front of the fire, or totems. Sometimes I thought of telegraph poles crossing a distance, or some strange kind of forest. The dance, movement, feels closest but it doesn’t seem to work to give them narrative meaning. They stabilise, give points of reference. I was surprised that it didn’t feel raw to me, but polished. Was that the neat framing (a little glint of order) and gallery lighting? But the painting is almost self-framed, with less dense areas towards the edge. It stays in its frame – all that energy actually contained! – and my eye stayed in the frame. Jackson Pollock (1912 – 1956) was born in Wyoming USA and travelled to New York as a young man to train as a painter. He studied with Thomas Hart Benton who painted in a Regionalist manner. Benton’s influence can be seen in works such as Going West (ca 1934 – 1935). 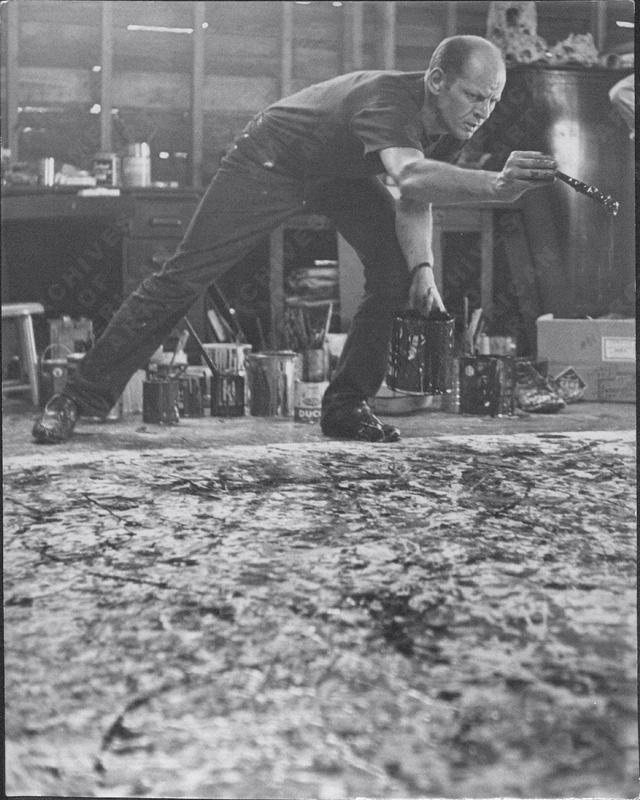 Pollock, in common with other artists in New York around the 1940s, was looking for new ways meanings and new techniques in painting. Although influenced by recent European-based movements, in particular Surrealism, there was a sense that the cutting edge of culture and artistic development was now in America, and particularly New York. There was a feeling of “immanent self-importance” (Anfam, 1990, p. 79), and as described by Ann Temkin “the boldness of what these artists were trying to do … needed to be evident in how they made their paintings. Each of them invented essentially a new tactic for how to make a painting” (Temkin, 2010, 01:22). Rather than comparison with the work of other abstract expressionists, it seems most helpful to view Blue Poles in the context of Pollock’s other work, developing from or reacting against his early studies with Benton. Untitled (Composition with Figures & Banners) (1934-38) 27.0 x 29.8 cm (mfahouston.blogspot.com.au/2011/07/contemporary-number-6-jackson-pollock.html) has energy and force in a swirl of twisting shapes. Landau (1989, p. 36) identifies traces of Benton’s teaching in the “spiral dynamics”, while White notes the connection to “one of Benton’s ideas … that a horizontally oriented picture should be organised by means of a series of vertical poles placed at intervals on the canvas, around which rhythmic sequences could be arranged” (White, 2002, pp. 15-16). While elements of this compositional theory remain, there is little representational material with the focus on the dynamics of the painting. In the 1930s Pollock was exposed to the work of Diego Rivera, José Clemente Orozco and David Alfaro Siquerios, Mexican mural painters with an experimental approach to the types of paint used, the method of application and the embedding of sand and other materials. Pollock once wrote that he “believe[d] the easel picture to be a dying form, and the tendency of modern feeling is towards the wall picture or mural” (Pollock, 1947). His first steps in this genre were with Mural (1943) 243.2 x 603.2 cm (uima.uiowa.edu/mural/), commissioned for Peggy Guggenheim’s townhouse, a huge canvas intended to act as a mural. 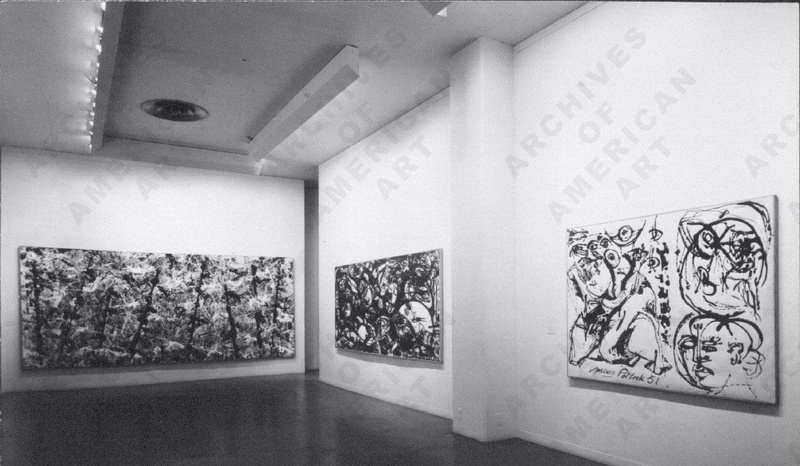 Anfam (2002, p. 101) described Mural and other works by Pollock of the period: “a tremendous plasticity sweeps everything together so that blunt cursive gestures, filigree strokes, drips, splatters, numbers, broken scumbles and opaque overpainting run into one dancing optical medley”. From reproductions in books and on the internet, it appears that a series of dark almost-verticals across the canvas provides a rhythm and structure in the large space. Representations of animals almost break through, but the overall effect is abstract. I would love to view the work in person, but given that is impossible quote from the University of Iowa Museum of Art [n.d.](which owns the painting) website: “in Mural it is the bravura of the brushwork—objective, yet ambiguous—coupled with the vast size (it is the largest Pollock painting) that gives it its unique status. With Mural, Pollock liberated painting from the confines of scale.” Painted for a (relatively) domestic setting the painting is intended for close viewing, with its intricacy inviting the viewer in and its broad rhythms pushing back. The parallels to my experience with Blue Poles seem clear. While presenting these works chronologically, I want to avoid the sense of a strict linear progression. Careful selection of works can give the impression of clear steps of development and ongoing “improvement”. So I will take a moment to look at Totem Lesson 2 (1945) 182.8 x 152.4 cm (nga.gov.au/international/catalogue/Detail.cfm?IRN=45694). In this areas of earlier work are changed and concealed by a flat grey paint, in the process revealing or creating new imagery. I found it a dark and even frightening work, nightmares struggling out of the dark and unconscious into the room (Pollock spent years in psychotherapy). It is both ugly and beautiful – that dog to the right of the central totem figure has fluid lines and a wonderful vitality. One struggles to pierce the concealing fog of paint. As with Blue Poles the viewer vibrates between the surface and the depths of the painting. It has calligraphic elements, with scribbled marks and lines, patterning across the canvas, and a shallow space with any hierarchy suggested by scale and placement. These combine with iconic elements – the central figure (a totem? ), the dog (a spirit guide? ), what could be knives, or masks, or … . Lloyd and Desmond (1992) wrote “Pollock intensified the sense of spontaneous improvisation as the painting progressed; the execution begins to rival the image as the main vehicle of expression”, and I think I can see that tension between the emotion and meaning of the forms and the that of the lines and paint itself. In Autumn Rhythm (Number 30) (1950) 266.7 x 525.8 cm www.metmuseum.org/collections/search-the-collections/488978 figure and ground have gone. Once again reproductions are unsatisfying, but Anfam (2002, p. 130) claims “never had painting been so far from the compositional hierarchies, perspective and figure-ground relations… In these liberated fields only the differing densities of line, no longer reading as contour anyway, imply depth gradations. But they do so along an absolutely frontal axis as if both were suspended in an eternal present”. One of the reasons I selected this particular painting is that I believe it is the one Pollock was working on when photographed by Hans Namuth. There is also some slightly later film taken by Namuth – see http://www.youtube.com/watch?v=CrVE-WQBcYQ. These iconic images are always in mind when looking at a work by Pollock, but even without them one would be aware of the sweeping gestures and overall physicality of the method Pollock developed. At times the paint is dribbled or poured, at others it loops up into the air where it twists and turns, might lose surface tension and break into parts, then falls to the canvas which captures that moment, that movement of paint, that pull of gravity. While embracing improvisation and spontaneity Pollock maintained great control over his line as thinned, thickened or pooled – he denied chance or accident. Michael Fried (1965) argued that using these techniques Pollock “managed to free line from its function of representing objects in the world, but also from its task of describing or bounding shapes or figures”. Pollock liberated himself from constraints in materials and how he used them, from detailed planning and his own preconceptions, from traditional composition, figure and ground. The word “liberated” is repeated in many of the texts I read. From the course textbook: “the marks on the canvas were liberated from any possible representational significance; they simply recorded his engaggement with the medium, forming a graph, as it were, of his emotions as he struggled with the viscosity of paint” (Honour and Fleming, 2009, p.835). Pollock painted Blue Poles in 1952. It is slightly smaller than Autumn Rhythm, but still large in scale. It has the great sweeping gestures and the intricate detail, and includes dribbles of paint – at times during painting it was hung on a wall as well as laid on the floor. It has much more colour – in Autumn Rhythm there is black (which forms an initial linear framework), white, brown, a dull turquoise and the unprimed surface of the canvas; in Blue Poles the initial black is more a puddle with sprays out, turning greenish in places where mixed with yellow or orange, then aluminium, white, yellow, red-orange. Pollock said “the modern painter cannot express this age, the airplane, the atom bomb, the radio, in the old forms of the Renaissance or any other past culture” (Pollock, 1949, p. 1) and the palette used in this painting appear highly appropriate to this need. The most obvious difference is the presence of the “poles”, ruled lines against the web of marks. Pollock seems to echo the banners of Untitled (Composition with Figures & Banners) (1934-38), present us with figure and ground, and suggest representation. In the photographs of Autumn Rhythm I think I can see a series of almost-verticals in the tracery across the canvas. In Blue Poles they are clear, straight, dancing across the canvas. They don’t simply lie on top of earlier, free lines – further work was done, there is some integration and overlap of the poles. 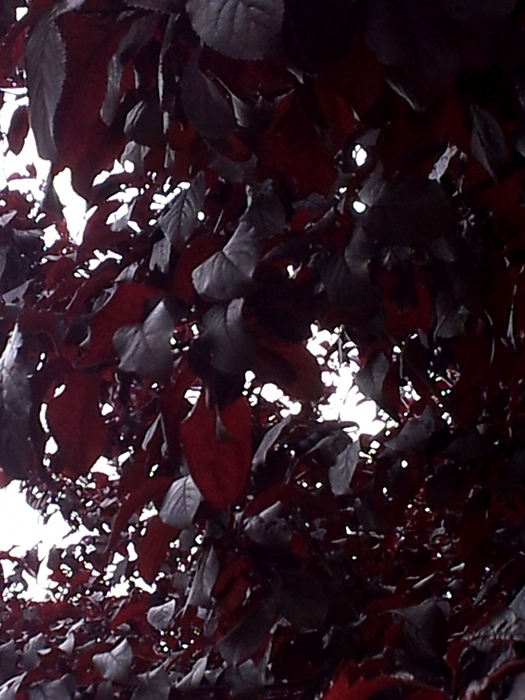 However the contrast in texture and nature of the lines is extreme. However despite this I found when sitting with it for a while there is so much complexity and interest in all areas that I can’t see any area as ground – just different. “Pollock’s finest work belongs to a relatively brief period, 1947 to 1951” state Honour and Fleming (2009, p.835). A line is drawn and clearly Blue Poles, painted in 1952, is the wrong side. Anfam (1990, p. 176) wrote of the “overwrought, hence belatedly restructured Blue Poles“. 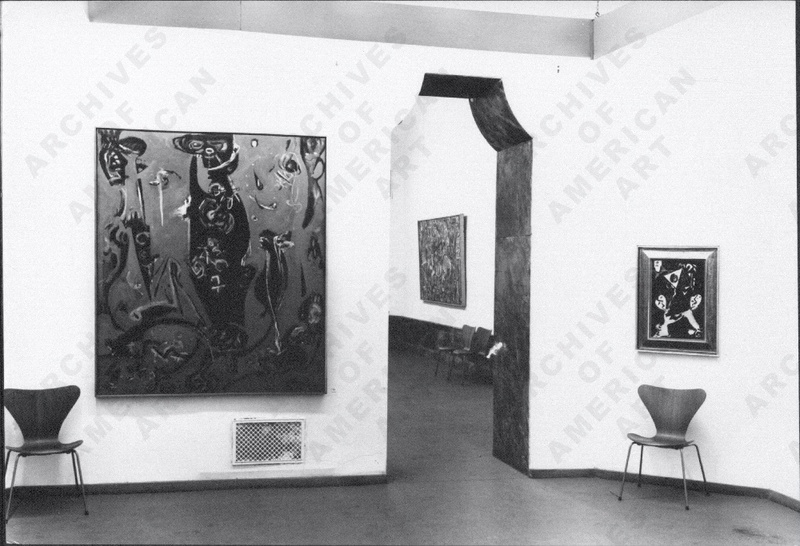 Clement Greenberg said (about Pollock’s work shown in 1952 but not specifically about Blue Poles) “[Pollock] had gone back to colour and some of the pictures were shaky. I feel that he felt that he’d run out of inspiration. Not because of the limitations of the technique – he’d run out of charge” (Greenberg, “Jackson Pollock” documentary, 36:40). On the other hand Landau (1989, p. 222) was positive – “This work has to be considered [Pollock’s] last masterpiece. By the addition of a brilliantly conceived and executed overstructure, Pollock managed to create one more electrifying composition. Dominating the less coherent underlayers of the painting and weaving what some have described as a totemic spell, the eight angled rods of Blue Poles triumphantly exert their author’s briefly revived authority”. Any work of art can give rise to different reactions, but I suggest there are some particular forces in play here. In an era which valued innovation and progress very highly, been seen as returning to earlier work could be regarded as regressive or weak. Although there was no manifesto or common approach among the abstract expressionists, a move away from the surface of the painting, introducing a form, some kind of hierarchy could be seen as unacceptable. Most commenting on the painting would be aware of Pollock’s emotional difficulties and alcohol abuse at this period, which might influence opinion. Pollock’s early death in 1956 meant that if he was taking early steps in a new direction any potential further works or breakthroughs that may have given additional context never eventuated. Anthony White has noted that as well as “not fit[ting] easily into the trajectory of what is considered the artist’s major work”, Blue Poles‘s relative isolation in Australia meant “it was largely excluded from art historical debates during the period in which scholarship on Pollock advanced considerably” (White, 2002, p. 14) (an interesting reversal of my difficulties here in appreciating works held outside Australia). In addition, the publicity surrounding the Australian purchase of Blue Poles and various claims that it began as a collaboration of a small, drunken group could influence opinion. Having spent some very rewarding hours with the painting, and unable to experience directly Pollock’s ‘classic’ large works for comparison, I can only acknowledge the power and excitement I felt in Blue Poles. I cannot accept the suggestion it is overwrought. The poles and all the other elements of the painting act together. White points out that the poles also act as masks, obscuring earlier marks, possibly Pollock responding to what he was finding in the painting as he worked. In this reading the poles become “a deliberate layering to create an artistic dialogue” (White, 2002, p. 34). Thaw (1986, p. 21) wrote of the “constant interplay between elements of figuration and abstraction” in Pollock’s work Pasiphaë (1943). Perhaps Pollock’s work in total can be seen as an ongoing exploration of the tension between those elements. White (2002, p. 36) writes that “by adding the poles, with their ambiguous suggestion of figures, Pollock kept the crucial dialogue between figurative and abstract art open”. While working on this annotation I read that in 1957, in “an act of courage”, Robert Hale acquired Autumn Rhythm for The Metropolitan Museum of Art for US$30,000, “an almost unheard of price for an American painting” at the time (Thaw, 1986, p. 9). This neatly foreshadows the notoriety of Blue Poles in Australia when it was purchased by the government in 1973 for the then-record price of A$1.3 million. This purchase was “largely due to the courage and foresight of James Mollison” (Kennedy, 2002, p. 9) supported by the incoming very progressive government led by Gough Whitlam (which also abolished conscription, recognised China, set up Medicare and much more.) There was a huge outcry, some in support and many appalled by the cost and even more the type of work – was this really art? Were we making fools of ourselves, being conned? Forty years later Blue Poles remains a household name, iconic. I think if you asked any random group of Australians to name a work of art it would be 50-50 Blue Poles and the Mona Lisa. A few weeks ago I spent four days at the National Gallery and some of that time watching the people looking at the painting. Blue Poles is the destination painting (it’s on the car park signs! ), school groups surround it almost constantly (the next group lurking nearby), adults search for it – everyone wants to see it, everyone has an opinion, positive or negative, and everyone seems to feel so proud, so clever, that it’s ours. As I said at the beginning, this could be interpreted as just a different variant of cultural cringe and a change of imperial masters. I don’t agree. It gets people looking at and talking about art – not just Blue Poles, but more international art at the NGA and the Australian art (aboriginal and other). It shows us that we’re not so far away, but can mix it with the rest of the world. Fried, M. (1965) “Jackson Pollock” in Art Forum 4 (1), September 1965 pp. 14-16. Reprinted in White, A. (ed.) (2002) Jackson Pollock’s Blue Poles. Canberra: National Gallery of Australia p.24. Kennedy, B. (2002) “Director’s Foreword” in White, A. (ed.) (2002) Jackson Pollock’s Blue Poles. Canberra: National Gallery of Australia, pp. 9 – 11. White, A. (2002) “Jackson Pollock’s Blue Poles” in White, A. (ed.) (2002) Jackson Pollock’s Blue Poles. Canberra: National Gallery of Australia. To many to list! but one I really want to mention – “MoMA’s Jackson Pollock Mystery” uk.phaidon.com/agenda/art/articles/2013/may/29/momas-jackson-pollock-mystery/. Discoveries made when conserving One: Number 31, 1950, including a video presentation by the conservators. For this exercise I need to research an abstract sculptor working after 1950. Henry Moore’s working life extended from the 1920s to the 1980s. I have chosen to focus on Moore because I have been able to view a number of his works in recent months. There is also a large amount of information on Moore and his work available on-line. Moore set up a Foundation which encourages appreciation of visual arts in general and the preservation and appreciation of Moore’s works and legacy in particular, and the Foundations’s website www.henry-moore.org/hmf is extensive. Most of this Research Point will be links to items I found of interest. A detailed history can be found at http://www.henry-moore.org/pg/henry-moore-online-resources/a-more-detailed-account-of-moores-life-and-work. Figures bulky – strong and powerful. In Melbourne at the National Gallery of Victoria I saw the stone Half figure (1933) (see www.henry-moore.org/works-in-public/world/australia/melbourne/national-gallery-of-victoria/half-figure-1930-lh-91). In my eyes there was a kind of ponderous, monumental beauty mixed in with the rather awkward rigidity of the figure. I can’t show my photos here, but I was also somewhat amused by the echoing paired rondure of the breasts, buttocks and hairstyle. Reclining figures – seen in early work (1929 at the Leeds Art Gallery – see www.henry-moore.org/works-in-public/world/uk/leeds/leeds-art-gallery/reclining-figure-1929-lh-59 and www.leedsartgallery.co.uk/gallery/listings/l0062.php), and in late work (1980 at the Art Gallery of New South Wales (AGNSW)- see www.henry-moore.org/works-in-public/world/australia/sydney/art-gallery-of-new-south-wales/reclining-figure-angles-1979-lh-675 and www.artgallery.nsw.gov.au/collection/works/6.1981/. Returning to one of his fundamental themes allowed Moore freedom to experiment with forms. 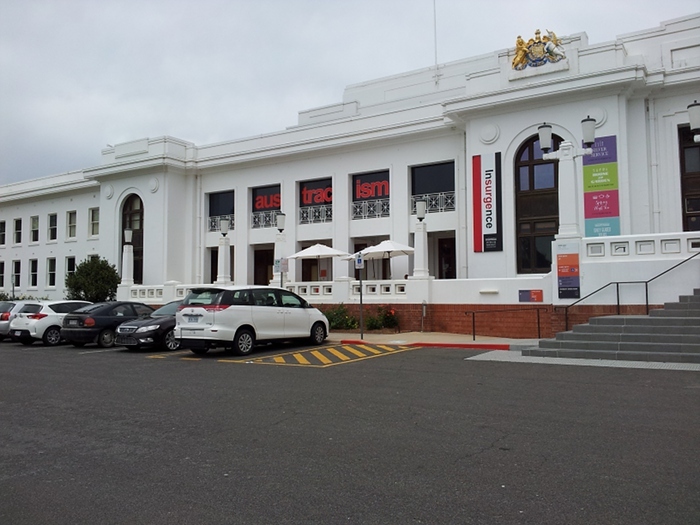 The photos show various views of the AGNSW work linked above. It shows the drapery which Moore used to create more tension in a work. It also shows how far Moore moved from the initial human figure when working, even if overall it still retained close links. The placement of the head on those wide shoulders, the twist as it looks around, the apparently totally unrelated spine all combine in a rather unnerving way. I found a quote from Moore cited a number of times on the Foundation website (http://www.henry-moore.org/): “I want to be quite free of having to find a ‘reason’ for doing the Reclining Figures, and freer still of having to find a ‘meaning’ for them.” (Henry Moore quoted in John Russell, Henry Moore, Allan Lane, The Penguin Press, London 1968, p.28). This work seems to have no reason or meaning beyond Moore’s interest in working with volumes and forms. Vulnerability and protection. Moore’s sketches of Londoners sheltering and asleep in the underground during the Blitz have a poignant vulnerability – for example see www.tate.org.uk/art/artworks/moore-grey-tube-shelter-n05706. In a sweeping generalisation, this suggests to me a different experience of that war between the British and Americans. In Britain there was a sense of community – a country digging deep, stubborn, surviving together. Americans were the heros riding in, the ones who dropped the bomb and changed the world – leading in part to the heroic, isolated figure of the abstract expressionist painter. Helmet. AGNSW has Helmet head no. 2 (1955), unfortunately not on display at the moment – see www.artgallery.nsw.gov.au/collection/works/9195/, and another version at www.henry-moore.org/pg/henry-moore-online-resources/illustrated-chronology-of-artwork/1940s. These look intriguing. When I first saw the AGNSW image there seemed to be quirky humour, but the text in the two links given suggest a wide variety of interpretations. The space between. Very often Moore’s work is not a solid form. It can be pierced by open space, or even be composed of separate elements with the space between as integral a part of the whole as the solid forms. Textile design. I learned of this by chance in another student’s blog a few days ago – see claireparrytextiles.tumblr.com/post/69721038636/henry-moore-textiles. There is an audio slideshow presented by Amanda Geitner at news.bbc.co.uk/local/norfolk/hi/people_and_places/arts_and_culture/newsid_8846000/8846599.stm and a review of an exhibition written by Fiona MacCarthy at www.theguardian.com/artanddesign/2008/oct/04/exhibition.art.henry.moore. You can also see lots of images on www.henry-moore.org/ by navigating to the online collection search and selecting Textiles. The designs look really lively with some exciting colourways, although unfortunately many of the photos show flat swatches so you don’t get a sense of movement. Lack of movement. From the work I’ve seen personally and on the web, it all seems rather heavy and motionless. These figures aren’t going anywhere – not just because they are often large and literally physically heavy, but because the figures themselves are still, sitting or reclining. An exception might be Hill arches which is discussed further below, but even that motion while vigorous is limited, not going anywhere. Warmth, humanistic and optimistic? That has been my impression, however McAvera (2001) suggests a much more complex psychological interpretation in a wide-ranging article that I found fascinating. With preconceived notions of maternal figures and a general level of warmth and fuzziness, I was shocked by the blatant sexuality of Hill arches (1973) in Canberra. The photo to the right shows the view I had of the work when I first saw it. 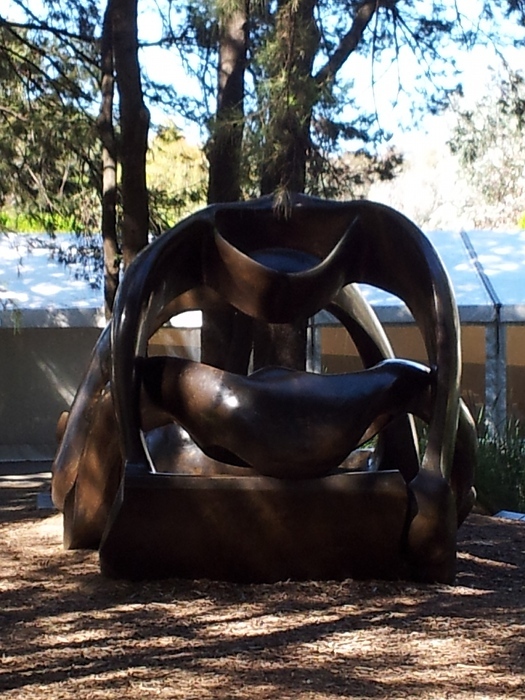 The allusion in the title of the work to landscape forms possibly suggests other interpretations, or at least parallels, but in my mind there is no doubt this is the largest artwork showing a copulating couple that I have ever seen. The combination of that subject with the gravitas of a monumental bronze, in a public garden, with the music of the carillon and birdsong, was quite disorienting. This work is also an example of the “space between” which I mentioned above. Unfortunately the video I took was too shaky and poor quality to be worth including, but you can see a slideshow by clicking any of the images below. McAvera, B. (2001) “The Enigma of Henry Moore” in Sculpture Magazine 20 (6) [on-line] Available from www.sculpture.org/documents/scmag01/julaug01/moore/moore.shtml (Accessed 13-Dec-2013).